March 2017 The Mills family became Parishioners at St. Joseph Church coming from Our Lady of Mercy in DC in March 1969. The family consisted of father Franklin, mother Arelia and their children Ira, Eric and Cynthia Dianne Bernadette. Arelia joined the Altar and Rosary Clubs. Franklin joined the Men’s Club and Ira and Eric became Altar Servers. All three children received Confirmation at St. Joseph Church. Since joining St. Joseph, Cynthia has graduated from Elizabeth Seton High School, received a BA in Journalism and History from Gannon University and a MA in Organizational Communication/Public Relations from Bowie State University. Once Cynthia completed college, she returned to St. Joseph no matter where she resided. Ms. Mills work (39 years) at the US Dept. of Education as a Records Manager. During her tenure, Ms. Mills has traveled to 45 states in the U.S. representing her office. She is the Executive Chief Steward for Council 252 for the Department. While attending St. Joseph, Cynthia has taught Religious Education and CCD to our teens for four years, became a member of the Hospitality Ministry, where she served as Vice President and President for more than seventeen years. In 2014, she joined Our Lady of Grace Sodality where she organizes our parish’s Bake Sales. Cynthia also proudly serves as an Adult Altar Server, is a member of the Extraordinary Ministers of Holy Communion and is a member of the St. Joseph Liturgical Committee. Cynthia is the proud mother of her son Franklin and is dedicated to her church and graciously gives thanks to our Lord and Savior, Jesus Christ for His goodness, love and many Blessings. The James C. Fletcher, Jr. Council 11422 February Family of the Month, Ms. Cynthia D.B. Mills. Loraine Hayling along with her two daughters Jamona and Tailor have been members of Saint Joseph since 2004. Loraine has been one busy parishioner. In May of 2010 she organized what became the 2nd Annual Women’s Day with the blessings of the Saint Joseph pastor Fr. Levester Jones. She continues leading this annual event. In September 2010 she also started the St. Joseph Women’s Ministry. This ministry was birthed as an avenue for healing from the UNMET NEEDS, UNRESOLVED ISSUES, and UNHEALED HURTS women often experience in their lives. The ministry consists of two programs: Seven Steps to Wholeness & Completeness which Loraine has been facilitating for the last 6-years and the Gabriel Network Program which helps meet the needs of women challenged with a crisis pregnancy. Prior to the women’s ministries Loraine first served as Religious Education Teacher for fifth and sixth grades for a number of years. Loraine is also a member of the St. Joseph Staff, providing Financial Services and an active member of the St. Joseph Social Justice Social Concerns Ministry. The oldest daughter, Jamona assisted Mrs. Wallace with religious Education for 1st graders, up until her graduation from High School in 2008. Jamona was one of the set of St. Joseph parishioners to receive the College Bound scholarships which started in 2008. Following High School, Jamona attended and graduated from the University of New Haven in Connecticut, with a degree in Legal Studies. The youngest daughter, Tailor keeps her plate full as well. She has been playing the violin with the choir for the past 2-years. She is also an Altar Server and a member of the Saint Joseph Youth Ministry. Tailor is a junior at Elizabeth Seton High School. Let us always remember the Hayling family in our prayers and ask the Almighty Father to reward them abundantly. In Jesus Name, Amen, Amen! Cherry Neal has been member of St. Joseph Church since 2001. Cherry visited St Joseph Church in the summer of 2001 and never left. Initially, she just attended Sunday mass. However, God always has a plan. Unexpectedly, one day, her Mother telephoned her at work and asked her how she plan to contribute to the church. In her Mothers’ words, “are you just a Bench Member, or are you willing to work in the church to thank God for the many blessings bestowed upon you’. After that conversation with her Mother, she joined the Hospitality Ministry. In September 2007, Cherry enrolled in the RCIA class and started the journey to receive the sacrament of confirmation. She was confirmed at the 2008 Easter Vigil. She was so inspired by the RCIA team she joined the team the following September. As Cherry became more active in the parish, she joined the Good Samaritans, Bereavement, and the Arts and Environment Ministries. She is the current secretary for the Good Samaritans and has served as the coordinator of the Arts and Environment ministry for the past two years. Cherry was a member of the St Joseph 90th Anniversary Committee and is an active member of the Black Catholic and Black History month committees. Her granddaughters Kameron and Amiya received the sacraments of baptism, first holy communion and confirmation during the 2015 Easter Vigil. Granddaughter, Amiya is a former member of the St Joseph’s Liturgical Dance Ministry, Children on Virtue. Cherry is a volunteer receptionist/ counselor at the Forestville Pregnancy Center. She loves working with the young women that come to the center. Not only has she found this ministry to be a rewarding experience but also a true blessing. She prays that she has made a difference in their lives. Cherry loves her St Josephs’ family. On her first visit to St Joseph’s, the parish community was so warm and welcoming, she knew in an instant that St Joseph’s was the church for her. Let us always remember this family in our prayers and ask the Almighty Father to reward them abundantly. In Jesus Name, Amen, Amen ! James and Roberta Barnes along with their sons, Marquis and Ramon have been members of St. Joseph's for 34 years. James is a charter member of the James C. Fletcher, Jr. Council and was the 1st Recording Secretary for the Council. James later was nominated and became the 6th Grand Knight of the Fletcher Council. 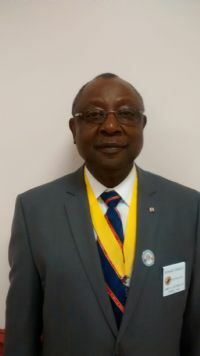 James also served as a member of the First Degree and Second Degree Team of District Council. James later served as a Trustee of the Council. James is a 4th Degree member of the Bishop James E. Walsh Assembly in Forestville, Maryland. He also serves as the Chief Shrine Usher at the 2nd Sunday 7:30 A.M. Mass. At St. Joseph's, James is an Extraordinary Minister of the Eucharist and a Member of the St. Joseph's Gospel Choir's, Baritone Section. He is also a member of the St. Vincent de Paul Society. Throughout all these years Lady Roberta and their sons have been in partnership. Roberta have served as Past President as well as Secretary of the KC Ladies Auxiliary. She continually contributes to all the Council and Church activities. Their son Marquis is a 2nd Degree Knight of the James C. Fletcher Jr. Council. While growing up, he was an Altar Server at St. Joseph's under the direction of Ms. Helen Harley. Ramon was a member of the Dr. Martin Luther King, Jr. Squires Circle. Ramon is currently one of the Audio Visual Technicians here at St. Joseph. He normally is seen at the 5 P.M. Vigil Mass on Saturdays. He also aides in the Annual Gospel Choir concerts here at St. Joseph. The family continues to be active in various church functions. The Fidelis and Janice Joseph family’s selfless contributions to the smooth conduct of weekly masses in St. Joseph Church is very worthy of note. They ranked top of the family of the month nominees’ list in June. The Knights of Columbus, James C. Fletchers, Jr., Council, #11422 is therefore, delighted to recognize the Joseph family as this month’s Family of the Month. Fidelis and Janice have been members of St. Joseph Church since 2004 and have ever since been very active through their participations in various church ministries. Their daughter Jesse is also very active and assists her father in audio visual duties at the 11am masses. 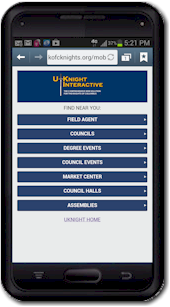 Fidelis is a 4th degree Knight with the James C. Fletcher, Jr. Council, Knights of Columbus, and has held different officer positions at both the Council and Assembly levels. He is very active and participates in many Council programs as well as the Parish annual multicultural picnic. Fidelis is also known to some parishioners as the A-V man! He is one of the parishioner responsible for the audio and video systems of not only the sanctuary but the entire church building. He has been a member of the St. Joseph Gospel Choir and has served in the Archdiocese of Washington mass choir. Although he is a Redskins fan, his favorite sport is Cricket. Janice has been a volunteer of the children’s liturgy since 2012 where she actively assists with providing instruction to the parish children during the 11 A.M. Masses. She and Fidelis have been members of the Cursillo since March 2008. According to Fidelis Joseph: their family’s love for the Parish community at St Joseph’s came on their first visit and made them feel at home and reminds them of mass in St. Lucia a Caribbean island. He especially loves the choir, the lively Masses, the real welcome of the parish community and of course the blessings of excellent priests. Let us always remember this family in our prayers and ask the Almighty Father to reward them abundantly. In Jesus Name, Amen! This is indeed the most wonderful time of the year, Spring, Summer and no snow. This Knights Sunday, the James C. Fletcher, Jr., Council 11422, Knights of Columbus has selected the Family of Daniel and Agnes Ihediohanma as its April, 2016 Family of the Month. Daniel and Agnes are religious parents of five (5) children and have been active members of St. Joseph Catholic Church since 2005. Daniel & his family have served in different ministries at St. Joseph Catholic Church Largo. Daniel is a member of the St. Joseph Emergency Response Team (SERT), directing traffic before and after the 11:00 A.M. Mass since 2012. Lady Agnes has been an active member of St. Joseph Gospel Choir since 2007. Anne, the oldest daughter of the family was a member of the Ministry of Hospitality from 2006-2007. Anne assisted in Youth Lock-in 20102011. Anne assisted in the children program during the Vacation Bible School in Summer 2014. Currently, Anne assists with the Youth Program that meets every 2nd & 4th Sunday’s of each month. She is also a volunteer for the Welcome Home Reentry program for returning citizens. Daughter Juliet was a member of the ministry of Hospitality Ministry from 2010-2013, and was an officer with the Youth Ministry from 2011-2013. Juliet served as volunteered for the Academic Tutoring Program 2010-2012. Juliet was the leader of the Youth Ministry performance during the Black History month of 2012. Rita is currently a member of the Youth Ministry and was an active member of the Youth Performance during the Black History month of 2012 where she performed as a librarian. For those outstanding services to St. Joseph Church, our Community, the James C. Fletcher, Jr. Council of the Knights of Columbus recognizes the family of Daniel and Agnes Ihediohanma as the April, 2016 Family of the Month. Father Almighty, may you continue to guide and richly bless this family in Jesus name. Amen! The “Shorter” Family James W. and Dorothy Shorter have been married for over 52 years. Out of this blessed union came seven children, 3 boys and 4 girls. A host of grandchildren and great grandchildren are also a part of this loving family. The Shorter family resides in Lanham, Maryland and both James and Dorothy are retired. They enjoy spending time with their extended family and in their youth, they both loved to go dancing. 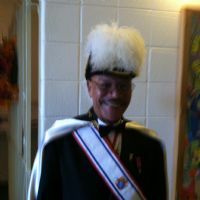 Sir Knight James Shorter has been a member of St. Joseph Catholic Church for over 30 years. He is a longtime member of the Hospitality Ministry, greeting parishioners at the 11 o’clock Mass, and is a member of The Men’s Club. He has been a member of the Knights of Columbus for over 20 years and has served in all facets of council activities, including Church, Council, Community, Family, Youth and Pro-Life. He is a mainstay and supporter of the council’s Annual Mardi Gras where he has served as bartender. Jim is always in the fore front of the Church Picnic, serving as its grill-master. He continues his cooking skills during Lent as a cook for the Fish Fry and throughout the summer at the Flea Markets refreshment stand. James was the recipient in 2005 of the Archdiocese of Washington Order of Merit Medal. An award established by the Archdiocese to recognize ordinary parishioners for service to their parish and the Archdiocese of Washington. Jim and Dorothy are loving parents and a true example of a Christians who devotes their time, talent and treasure building up the Kingdom of God everywhere he goes. For these notable services to St. Joseph Church and the Community, the James C. Fletcher, Jr. Council 11422 of the Knights of Columbus would like to acknowledge James and Dorothy Shorter as the April, 2016 Family of the Month. Heavenly Father, guide and richly bless James and Dorothy forever and ever in Jesus Holy name. Amen! On a Knights Sunday as this, we proudly honor our Parishioners who selflessly provide services that exemplify our Christian Values. From our reviews, during Fr. 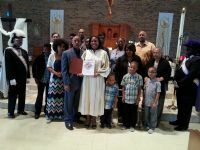 Raymond Moore’s tenure as the Pastor of St. Joseph Church, one of our very active Parishioner’s, Beverly Starks, became a registered member of St. Joseph’s Parish. As a devout Christian who attends mass regularly, she humbly accepted the role of the Lector Ministry Coordinator. Along with that, she functions as the Vice President of the Hospitality Ministry that welcomes Parishioners and Guests with smiles and greetings as they arrive at the Church for Masses. This Ministry not only welcomes the Worshipers, but also coordinates the collection of offerings and selection of Parishioners to carry the gifts during offertory procession at each Mass. Beverly as well spends her time serving as a member of St. Joseph’s Good Samaritans and the Repast Ministry that comfort bereaved Parishioners with fellowship after funeral and interment. She organizes the combined Liturgical Ministries Calendar used by Lectors, Eucharistic Ministers, Hospitality Ministers and Alter Servers. We are really proud to also mention her membership in the Archdiocese’s Sisters in the Spirit and her willingness each time to lend assistance to the Knights Lenten Fish Fries, Cup of Joe annual programs and the Summer Bible School. For these notable services to St. Joseph Church and the Community, the James C. Fletcher, Jr. Council 11422 of the Knights of Columbus would like to acknowledge Beverly Starks as the February, 2016 Family of the Month. Heavenly Father, guide and richly bless Beverly forever and ever in Jesus Holy name. Amen! The James C. Fletcher, Jr., Council 11422 of the Knights of Columbus is proud to usher in the Third Quarter of this Fraternal Year with the selection of Leon Andrews’ family as its January, 2016 Family of the Month. Leon has been a willing -to-serve Parishioner since he became a member of St. Joseph Church. During Fr. Raymond Moore’s tenure at St. Joseph Church, Leon for his meticulousness was approached by Fr. Moore to assist Helen Harley with the Sunday 8:30am Mass set-up. And as time went on, his handling of the Church set-up Assignments drew praises from the Parishioners. When this became noticed by the Father, Leon was graciously requested to also take over the set-ups for the Sunday 11:00 A.M. and the Tuesday 7:00 P.M. Masses. Leon currently serves on the Church Audio Team, assisting at Masses, Concerts, Funerals and other Church events. As mentioned above his willingness to serve anytime in the Church is often times observed. One day, while attending First Friday adoration at the Church, he was asked to assist the Father in performing the Benediction. He gladly accepted and has ever since been performing this function in our Church. Finally, Leon Andrews is the Cameraman in our midst that takes pictures/videos of Church Events that include Church Concerts and Picnics. With his vow to keep doing God’s Will in the Church, so long our Almighty God gives him the Desire, Grace and Good Health to do so. Church let us continue to pray that our Almighty Father grant him his wish in Christ Holy Name, Amen! This is indeed the most Wonderful time of the year and we must be joyful to justify the Second Coming of our Lord, Jesus Christ at Christmas. This Knights Sunday, the James C. Fletcher, Jr., Council 11422, Knights of Columbus has selected the Family of John and Theresa Leeke as its December, 2015 Family of the Month. John and Theresa Leek registered as members of St Joseph Church in 1969; now over four decades. John and Theresa are religious parents of four adult children. Three sons: Michael, Mark and Mathew and a daughter: Madelyn. The Leeke family has now grown to include two wonderful daughter-in-law's namely Lu and Pam. In the fall of 1970, Theresa at the request of Fr. Casey developed the Church Choir. That prompted the entire family to be come involved in the Church Ministries. She has served as the Director of the Choir from its inception. It is this same Choir that is often showered with praises at Masses by regular Mass and first time worshipers alike for their well-orchestrated songs. During her tenure, she developed Cantors, Youth and Junior Choirs, small Adult groups, and a Music Department. The Music Department includes: the Gospel Choir, Youth and Children’s Choir, Cantors, Adult and Youth Musicians for Liturgies, Liturgical Dancers, and Grow Your Own Musicians, a Ministry for Youth to learn to play at various Liturgies. John has served as a Eucharistic Minister and Coordinator during Fr. Raymond Moore’s Pastoral assignment. He to this day participates in this ministry. He also served on the Parish Council and on several Church Planning Committees and most recently on the Black History and Black Catholic Committees. Michael, the oldest son participated in the Youth Ministry and was an Altar Server from grades 4 - 12. Madelyn, the only daughter served in the Youth Choir in her years at St. Joseph Church. Mark, the middle son on the other hand, participated as an Altar Server from grades 3-12, contributed in the Youth Ministry and has worked in the Media Department of St. Joseph at the Gospel Choir’s Concerts. While Matthew, the youngest son was an Alter Server from grades 4-12, he was the Co-Founded of the Teen Club now known as the Youth Ministry. He also served in the Media Department and continues to serve at the Gospel Choir’s Annual Concerts. For those outstanding services to St. Joseph Church our Community, the James C. Fletcher, Jr. Council of the Knights of Columbus recognizes the family of John and Theresa Leeke as the December, 2015 Family of the Month. Father Almighty, may you continue to guide and richly bless this family in Jesus name. Amen! The McWilliams Family Every week in St. Joseph, families selflessly serve in different Church Ministries of their choice. One distinguished family is of David and Mary McWilliams who after relocating to Mitchellville in 1989 registered as members St. Joseph Church. Since they be- came members, they have assumed some notable responsibilities in the Church and/or Community. David and Mary have two children: a daughter, Davida and a son David Jr. whose growth in the Catholic Faith are being attributed to their parents’ good and solid Religious Ethics. Today, David’s execution of his duties in St. Joseph Church, indeed exemplifies dedication to the Fatherhood of God and the Brotherhood of Man. He is the parishioner you observe diligently maintaining unimpeded 11:00am Mass traffic flow as worshipers arrive or departure from the church parking lot irrespective of the weather condition. The duty notwithstanding, David still finds time to serve as a member of the Hospitality Ministry. Mary on the other hand is a member of the Lector and Bereavement Ministries. She is also a member of the St. Vincent De Paul Society and the Alter Service Team. For their remarkable services to St. Joseph Church and/or Community, the Knights of Columbus, James C. Fletcher, Jr. Council #11422 would like to recognize the family of David and Mary McWilliams as the Family of the Month of September 2015. For their continued services to the Church Community, our prayers go out to their family each day in Jesus name. Amen! The James C. Fletcher, Jr. Council 11422 of the Knights of Columbus this August would like to recognize the family of Eugene and Freddie Mae Poole as the Family of the Month for their remarkable contribu- tions to our Council and the St. Joseph Church/Community. Eugene and Freddie, the proud parents of a daughter, Michelle and a grandson, Malcolm, an Eagle Scout, have served the St Joseph Parish in various ministries since they became members in 2002. In 1994 Eugene began serving on the Board of Directors Catholic Charities for the Archdiocese of Washington, DC and was later elected Chairman of the Board of Directors of Catholic Charities in 1996. He served as the Coordinator for the St. Joseph Church Audio Visual Committee from 2004 - 2013 and was responsible for upgrading the Sound System to its current state of the art level that extends to the Rosemont Room and all three Classrooms with closed circuit Television. Currently, Eugene serves on the Financial Council at St. Joseph. Eugene and Freddie Mae were the facilitators for the Marriage Preparation Program here at St. Joseph Parish from 2003-2012. Their Marriage Program Ministry started in 1992, undergoing training at the Archdiocese of Washington and serving for over 20 years at St. Teresa of Avila and at St. Augustine’s Church mentoring hundreds of couples throughout the years. Because of the Poole’s dedication to the Archdiocese Marriage Preparation Program, services to the Board of Directors for the Catholic Charities, involvement in the Cardinal Appeal Committee and other church ministries, they were selected as Family of the Year in 1992 for the Archdiocese of Washington and were privileged to accompanying Cardinal James Hickey to Rome to attend the International Meeting of Families with Pope John Paul II. Eugene and Freddie Mae were also Coordinators for the Forward in Faith Campaign here in St. Joseph Church from 2003-2004. Due to their full commitment, St. Joseph Parish surpassed its goal set by the Archdiocese of Washington by 20% with more than 1million dollars in recorded pledges. Freddie Mae joined the Arts and Environment Committee in 2003 nd was the Coordinator of the Arts and Environment from 2008-2014. She also joined the Deliberate Disciples in helping to plan activties for the National Catholic History Month. . For these contributions, may the Almighty Father Bless you in Jesus name. Amen! This July, the James C Fletcher, Jr. Council 11422, a Star-Council of the Knights of Columbus has embarked on a new fraternal year. We will continue to build our Order and make the Knights of Columbus an essential part of the lay ministry of our church. This, of course, will enable us to exemplify our Solidarity with our Priests and Bishops. It’s always worthy of mention that within the integral ministries, are fellow parishioners whose daily contributions need to be commended because they provide support to our Church and our Christian Faith. So for this reason, we are extremely proud to recognize the family of Jeffrey and Bernadette Crawford as the Fletcher, Jr. Council Family of the Month for their remarkable contributions to St. Joseph Church and Community. Jeffrey and Bernadette Crawford are parents of two sons Alvin and Brandon and the proud grandparents of a granddaughter Savannah They have been active members of St. Joseph Church since 1990. Jeffrey is a devout Christian who attends mass regularly. He’s a loving and a caring father who provides religious support to his family. On the other hand, Bernadette’s love for children and the Word of God has served as a Catechist and is the Coordinator for the Religious Education Program in St. Joseph Church. She is dependable, energetic and very productive in the Ministry. She has taught both Religious Education-Confraternity of Christian Doctrine (CCD) and Rite of Christian Initiation of Adults (RCIA) since 1991. Worthy of note are the CCD and RCIA programs she implemented and initiated respectively. Alongside with those, are the Religious Education curricula for grade 1 through grade 7 which she developed. Bernadette’s God given talent is often being exhibited at the St. Joseph Gospel Choir where she is a member and serves as the President. She works with the children/Youth choir that sings for the 11:00am Mass and helps with the planning/coordination of the Youth Volunteers trip and Vocation Bible School. Alvin and Brandon their sons have grown up strong in their Catholic Faith because of their parents’ religious ethics. The St. Joseph Church/Community is blessed to have the Crawford family performing such inspiring services. May God Almighty richly bless, keep them healthy and focused in all they do in Jesus name. Amen! The resurrection of our Lord Jesus Christ indeed brings us new life and renewed hope for eternal life. Therefore living as new people, our daily actions both in the Church and Community should demonstrate our will to pursue the Christian ideal. It’s worthy of note that in St Joseph Parish, we have families whose daily actions remind us of what our Christian Faith demands of us. 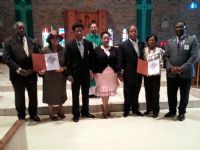 It is with great pride and honor in this last quarter of the 2014-2015 Fraternal Year of the Knights of Columbus that the James C. Fletcher, Jr. Council 11422, has chosen to acknowledge the family of Keith and Vanetta Wallace as the top Family of the Month for their contributions to St. Joseph Church and Community. Keith, Sr., is an active Parishioner, a member of the Men’s Club. He participates in the Parish Ministries. With his family, he holds daily Bible study in their home, studying the scripture and ways of proclaiming the message. Vanetta, is a member of the Young Adult Ministry. She is an Ultreya Leader for the Central PG Ultreya under the Archdiocese of Washington’s Cursillo Movement, a Worldwide Organization within the Catholic Church. She serves as the Assistant Choir Director for both the Youth and Adult Choirs and a popular Cantor in the Gospel Choir. Keith, Sr. and Vanetta Wallace have two children and have been members of St. Joseph Parish since 2001. They are involved in different activities in the Church and/or Community. Keivana, the daughter is a member of the Children of Virtue Dance Ministry, a Peer Tutor, a Cantor and a very active member of the Children Choir. Keith, Jr. the son is also active as a member of the Children Choir and a Cantor. He is an excellent Saxophonist, often playing during the 11:00am Mass. And he is an active participant in the St. Joseph “Grow our own Musician Program”. We are indeed proud to have the Wallace family in St. Joseph Parish. God Bless the entire family.